Rural territory is an important part of the community’s living space, moreover, it is a living space for sustainable and smart development. With the growing public demand for a healthy living environment and healthy food, the role of rural territory as a living space for community and the necessity to maintain its sustainable development is increasing. However, the sustainability of rural territories as a living space will be preserved only when residents are ready for changes and if national institutions and local governments are promoting trends politically and practically. 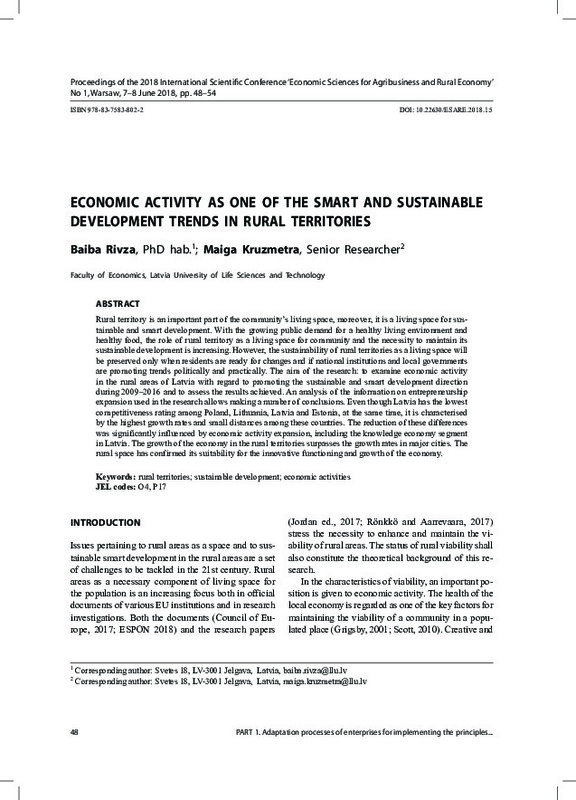 The aim of the research: to examine economic activity in the rural areas of Latvia with regard to promoting the sustainable and smart development direction during 2009–2016 and to assess the results achieved. An analysis of the information on entrepreneurship expansion used in the research allows making a number of conclusions. Even though Latvia has the lowest competitiveness rating among Poland, Lithuania, Latvia and Estonia, at the same time, it is characterized by the highest growth rates and small distances among these countries. The reduction of these differences was significantly influenced by economic activity expansion, including the knowledge economy segment in Latvia. The growth of the economy in the rural territories surpasses the growth rates in major cities. The rural space has confirmed its suitability for the innovative functioning and growth of the economy.